Kauri trees are unique to northern New Zealand. Their enormous height and girth are seriously impressive when they are ‘fully grown’, but unfortunately that has contributed to their downfall – most of the ancient kauri forests have long been decimated by commercial logging and clearing for farmland. The Waipoua forest in the Hokianga region is one of the last few strongholds where this once prolific tree still reigns, and I have long wanted to take my boys to see it. In the kindy holidays, we took the opportunity. 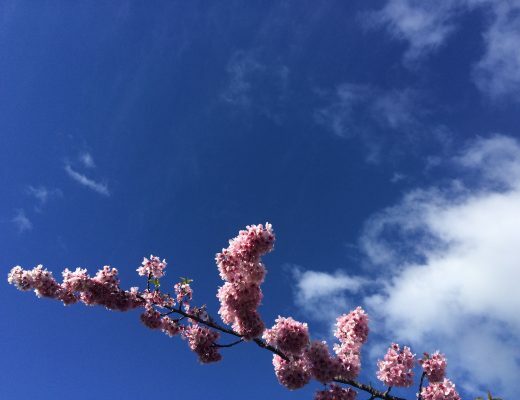 As we approached from Dargaville in the south, there was a huge contrast between the rolling green farm paddocks and the sudden descent into a narrow twisting road thickly clothed in dark bush on either side. It was like entering a tunnel full of leafy green textures, with just a ribbon of sky overhead. 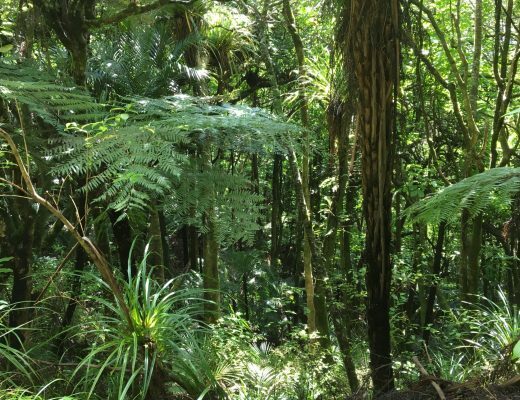 Suddenly, we noticed the canopy up ahead appeared different – here and there amidst the rimu and kahikatea, totara and puriri, we could see taller trunks rising, with outcrops of leaves looking almost circular from a distance, Dr Seuss-like. These were the first of the Kauri, and as we drove further into the forest, they were everywhere. It is devastating that there are so few of these trees left. We stopped at a forest lookout for a picnic lunch, and then continued on to the ‘Kauri Walks’ carpark. With Tasman in the backpack, and Nate running ahead, we hiked along a well formed track to see The Four Sisters, and Te Matua Ngahere (the second largest Kauri in the world). There is another 30 minute track to the Yakas kauri, but we saved that one for next time. It was gorgeous to be walking amongst such pristine forest. 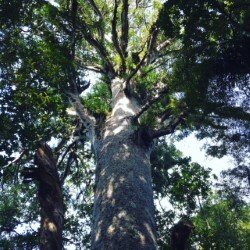 However, kauri are now facing a second threat to their survival. Kauri dieback disease is essentially a root fungus which was discovered in 2009. The disease spreads quickly and easily through particles of soil, and once it infects a tree it stops the flow of nutrients to the canopy. Death is inevitable. There is no cure. People who want to admire the trees can unwittingly carry the soil particles on their boots, walking it around the kauri. Every public walking track with access to mature kauri now has a boot cleaning station installed, where all visitors must scrub and spray their shoes on entry and exit from the forest. It’s not yet known if we’ll be able to beat kauri dieback, which is heart breaking. Take your children to see these trees now. 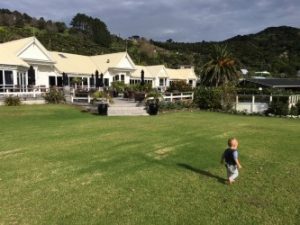 That night we enjoyed staying in beautiful Omapere at the Copthorne, right on the waterfront of the stunning Hokianga harbour. Being from Auckland, I always associate the west coast with black sand, so to see the huge white sand dunes reflecting the late afternoon sun was a really spectacular surprise! The hotel has a huge pool deck and restaurant with a lawn gently sloping to the beach. We watched people fishing from a jetty which stretched out into the harbour depths, with floats bobbing about and buckets of bait. The water lapped. In the distance, waves of white horses galloped across the bar, reminding me of the danger the early settlers faced getting their heavy, cumbersome sailing ships into safe anchorage. The central part of the old hotel (built in 1904) has remarkable murals portraying some of these early scenes, which helped explain some of the history to Nate. The gorgeous ceilings are panelled in unmistakeable kauri, beautiful and tragic at the same time. 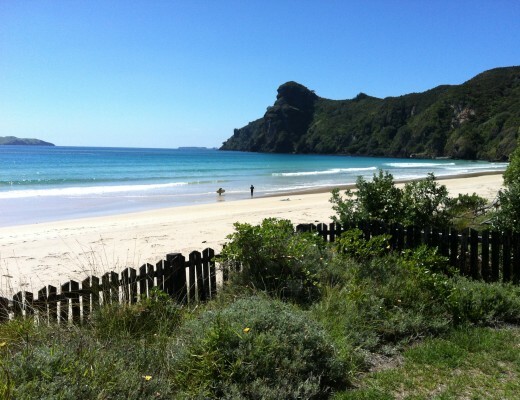 The new Twin Coast Cycle Trail is nearby at Horeke. 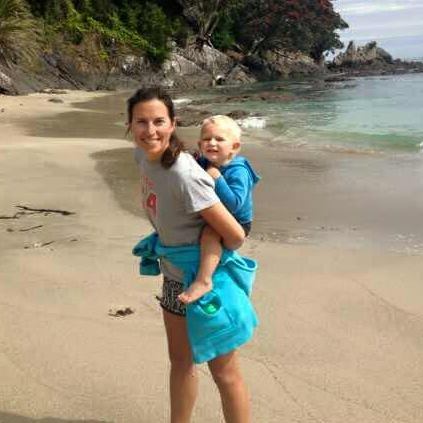 You can ride all the way to Opua in the Bay of Islands, off road. There were plenty of people about on bikes – it must be great for the economy of the area. 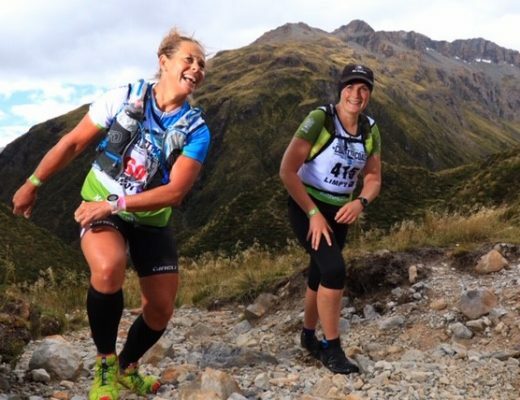 We’re looking forward to doing this trail soon with a tag-along for Nate’s bike and a trailer for Tasman. 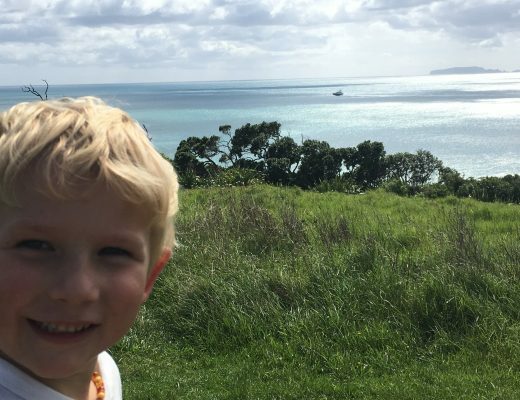 Kids will also enjoy a boat trip across the harbour to ride body boards down the sand dunes, and visiting the Koutu Boulders. 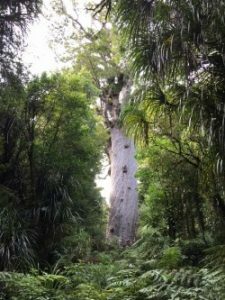 The next morning was the real highlight – Tane Mahuta, Lord of the Forest, the reason for our trip. 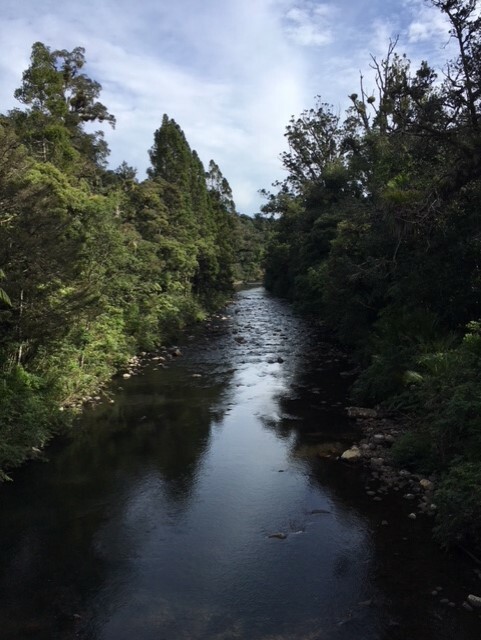 The temperature dropped noticeably as we crossed the wee bridge and stepped onto the forest boardwalk, built to protect the precious shallow-rooted kauri. We turned a corner, and there he was, stretching impossibly into the sky. I took a breath. Two thousand years of growth in front of us. The things he has lived through! Wondrous. Nate’s cold little paw found its way into mine as a local Maori tour guide began a soaring karakia, celebrating and showing respect to the mighty tree. The hairs stood up on the back of my neck. 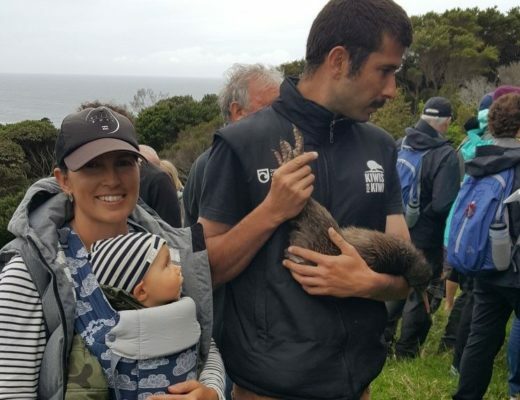 When he had finished, he showed us the tiny male and female cones of the tree, explaining how they are pollinated and fertilised, and then he produced a tiny kauri seed. ‘Ahakoa iti, he pounamu’ he said. Although it is small, it is such treasure. He winked at my little sons.